Technological advances in cochlear implants have proven to be amazing solutions. A cochlear implant is an electronic device that restores partial hearing to individuals with severe to profound hearing loss who do not benefit from a conventional hearing aid. The physicians and audiologists at the Hearing & Balance Institute are specially trained and have detailed experience in performing the surgery to place the device and to customize the programming of the device after surgery. 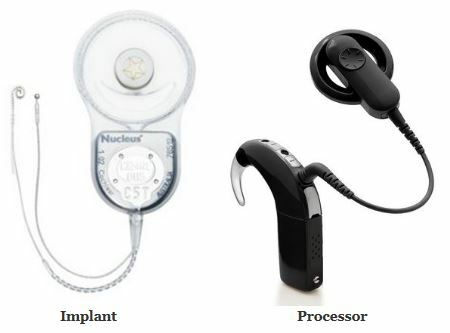 There are two components to a cochlear implant system: the implant and the processor. Our surgeon will place the small implant under the skin behind your ear, completely hidden from view. Two to three weeks after surgery, you’ll return to our office where an audiologist will program the processor. The processor captures sound and converts it into digital information, which is then transmitted to the internal implant. The electrodes of the implant stimulate the cochlea and send sound signals to your brain. These signals are what ultimately become sounds such as music or speech. Cochlear implants will improve the quality of life for both adults and children. Adults will notice an immediate improvement in their hearing and communication skills. Children who receive cochlear implants early enough (generally before 3 years of age) can develop speech and language that is on par with their peers.